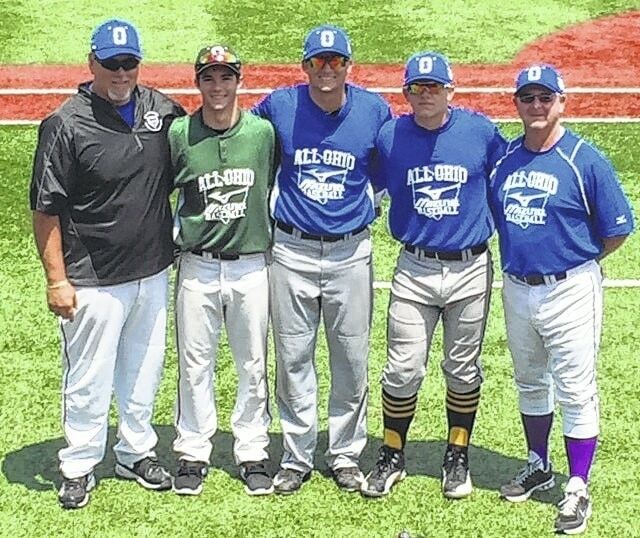 Five local baseball standouts represented Scioto County at the 2015 Mizuno Senior All-Star Series over the weekend at Bill Davis Stadium, home of Ohio State baseball. Recent Minford graduates Matt Joyce and Dylan Shockley, along with recent Wheelersburg graduate Wade Martin earned All-Ohio honors and were invited to participate in the annual All-Star game for the state’s top seniors. Earlier this month, Shockley was named Division II first team All-Ohio as a catcher by the Ohio High School Baseball Coaches’ Association (OHSBCA). He, along with center fielder and leadoff hitter Joyce, helped lead Minford to a 20-3 record in 2015 and a spot in the district finals. Joyce and Shockley will remain teammates next season, as both have committed to play baseball at Rio Grande. Falcon junior first baseman Eli Daniels was also named to the OHSBCA Division II first team All-Ohio last week. Martin was awarded Division III second team All-Ohio for his phenomenal pitching for Wheelersburg this season. Martin helped lead the Pirates to their sixth-straight state tournament by striking out 46 batters and walking just one in five postseason appearances. He will pitch for Division I Marshall next season. Also representing the SOC in the Mizuno All-Star game was Symmes Valley senior Tanner Mays. He was named a Division IV All-Ohio Honorable Mention by the OHSBCA earlier this month. The Mizuno All-Star game also invited two outgoing coaching legends to participate in the game — Minford’s Tim Martin and Valley’s Dean Schuler. 2015 marked the final season of Martin’s 20-year coaching career at Minford. He led the Falcons to over 300 wins and two district championships during his tenure. Martin was also named SOC II Coach of the Year five times. Martin stepped down to focus full time on his scouting job with the Boston Red Sox. Schuler coached Valley for 34 years before announcing his retirement at the end of this season. In his time in Lucasville, Schuler amassed more than 500 wins and two regional finals appearances. The Mizuno All-Star series is an annual tournament put on by the OHSBCA. High school baseball’s top seniors from across the state are selected by the Coaches’ Association and placed on one of four All-Star teams that compete against each other throughout the weekend.